Betterment remains the most well-known robo-advisor in the market, with more than a quarter-million clients and $10 Billion in assets managed. We think Betterment is pretty much perfect for new investors who don’t want to spend many hours learning about investment. It’s also a great place for more experienced investors to park their money and watch it grow, with some tax advantages added for good measure. Now is a good time to sign up with Betterment for the first time, because you could get up to 12 months free (no management fees!). Click here to see promotion details. New Betterment enrollees currently enjoy double payouts for accounts with $100,000 and more. Customers with taxable accounts of $100,000 also receive a free Canary home security device. More on that later. Betterment enrolls new investors in an automated portfolio of stocks and bonds. Betterment charges a flat 0.25% annual balance fee for their service (and .40% for advanced advice and portfolio tailoring). 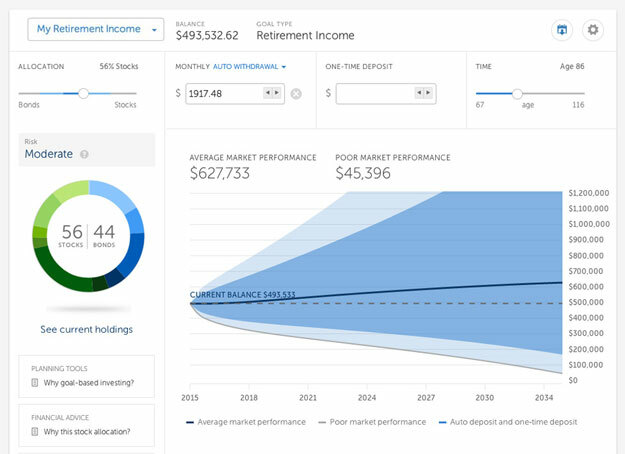 Betterment’s intuitive website shows you how much you need to contribute for retirement, and you can see how your account will grow over the years in all kinds of market environments. With automated deposits, you won’t have to manage a thing. Betterment’s tax-loss harvesting, automated diversification, Tax-Coordinated Portfolio, and reinvestment of dividends will make your money grow and save you money on taxes. Currently, Betterment is offering new users 6 months commission-free! It’s affordable. It’s simple, effective investing for the internet generation. Our enthusiasm about Betterment is real. Read on to learn why. See Betterment Pricing and DetailsStart investing smarter! Betterment was founded in 2008 by Jon Stein, who still serves as CEO. The company launched in 2010 after a big debut at TechCrunch Disrupt NYC. Betterment quickly scored $3 million in funding and has enjoyed steady growth ever since. Today, Betterment has more than 150,000 users, and manages more than $4 Billion. The press has been kind to Betterment, and you’ve likely seen glowing reviews in the Wall Street Journal, Forbes, and CNN. Betterment’s portfolio results have proved that this is more than hype. Almost a decade from its inception, Betterment is here to stay, and they’re a major player that’s bringing a new generation into intelligent stock market investment. Better Investment Performance: Independent investment managers usually charge more than 1% annually, and often fail to beat average (unmanaged) market returns. Betterment has “beaten the market” 88% of the time since its inception, using a portfolio of US and international stocks compiled by their panel of experts. Betterment’s portfolio grew a massive 101.3% between 2009 and 2014. In 2013 the platform boasted 11% growth, with a 70% stock allocation. New User Promotions: Betterment’s new user promo waives the service free for up to 12 months for new accounts. There are extra perks for those who refer other users as well. Seamless Platform Performance: Betterment platform performance couldn’t be better. Whether you’re using the platform on your desktop, your cell phone/smartphone, mobile device, or any other piece of tech you can fathom, Betterment runs like butter. It’s a 21st century platform and it just works. Better Investment Options: It’s easy to create custom allocations and personalized investment goals. Users can also create a variety of account types, including taxable and non-taxable accounts. We have found every element of the Betterment system to be strong, an investment model that offers the best results to the most people. If you’re too busy to read the full review below, here are answers to your deepest burning questions about Betterment. How Much Does Betterment Cost? Betterment recently changed their pricing policy. All users now pay 0.25%, regardless of account balance for standard digital services. This is a discount for low-net worth users (who used to pay 0.35%), and a price increase for high-net worth users (who used to pay 0.15%). Betterment has also introduced Premium services for 0.40% which include personalized asset advice and management. Betterment Vs. Vanguard. Vanguard can sell you the same portfolio as Betterment, for a little less money in annual fees. But only if you are willing to do a lot more work on your own. In most cases, the cost difference is very slight. At Vanguard, You’ll also have to perform all your own tax-loss harvesting (a Betterment perk and savings opportunity that can more than cover the cost of your Betterment fees), tax-coordinated portfolio service, re-allocation, re-investment, etc. Betterment is regulated and its users are insured by the SIPC. It also has awesome scam/fraud protection and encryption. See their BBB rating here. Can I Use Betterment in Canada? Can I Use Betterment in Australia? Sorry No, and Nope. They’re working on making it available, so hang in there. *Note: Betterment stocks slightly favor value and small-cap stocks, which historically outperform the broad market. You wanted a detailed Betterment review. We tried to leave no stone unturned. There are a lot of aspects to Betterment’s service. Here’s what we’ve found after more than a year of use. Tax-Coordinated Portfolio: Betterment’s TCP adds a lot of value to the already great service. A Betterment-controlled Tax-Coordinated Portfolio is a way to automatically put expensive holdings into tax-protected accounts, and cheap holdings into taxable accounts. Of course, this only works for people who have multiple accounts with Betterment, but as you use the service longer and longer, you’ll likely do just that. Let’s say you have one taxable account, one Roth IRA, and one Traditional IRA. Betterment’s algorithms automatically swap out all the assets contained in these accounts until they are in an orientation that costs you the least amount of money possible. Betterment estimates annual savings of 0.48%, or 15% over 30 years. Customer Service: I usually use email to contact Betterment. Betterment is responsive and detailed in their emails. I always receive thorough replies in less than 24 hours. Betterment chat is now available, and representatives are available by phone 7 days a week until mid-late evening EST. There is even a special line for 401(k) customers, Plus, and Premium customers. Promotions: Betterment offers up to 12 months of free service for new accounts with $500,000 and above. $10,000 new accounts get 1 month of free service, $25,000-$49,999 2 months, $50,000-$99,999 3 months, $100,000-$249,999 6 months, and $250,000-$499,999 9 months. Tax-Loss Harvesting and Automatic Re-Allocation: Betterment offers free Tax-Loss Harvesting and Re-Allocation/Portfolio Balancing. Both of these could be accomplished by users through traditional platforms, but the time and costs involved would quickly eat up the savings incurred. How Do I Sign Up For Betterment? At this point you might be ready to sign up for Betterment. Good news – it’s really easy. New users input all the usual information, then start asking some questions about their investment goals (risk tolerance, time-specific goals, etc.). You’ll be asked to link to your financial institution, which can be completed in minutes. New funds show up in just a couple of days, at which point your account is up and running. Users transferring IRAs and other accounts from other brokers will usually see the accounts appear in 2-3 weeks. There’s no minimum balance to begin, but make sure to take advantage of free service for the initial deposit amounts specified above. Once your account is humming along, Betterment will send you a series of helpful emails, detailing Betterment features and making sure you’re getting the most out of the service. Betterment understands how to make this helpful, not annoying, a delicate balance Vanguard hasn’t figured out, IMHO. Because so many users start Betterment IRAs, this account type is worth a little extra attention. Users can choose between a Traditional IRA, a Roth IRA, and a SEP IRA, depending on tax deference preferences. Betterment’s visualization tools make it easy to see the advantages of each tax model. In addition, users can start Taxable Accounts, 401k, Trust Accounts, and 529 Plans. 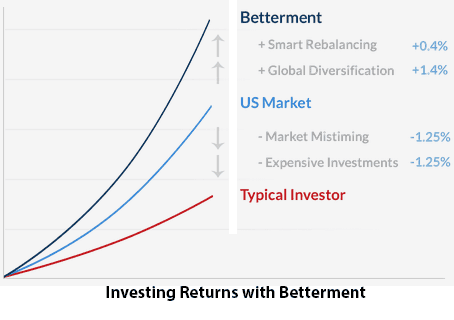 You’ve just read lots of words about Betterment investing. By now, you know we’re enthusiastic about Betterment, and that we have every reason to be. To sum up, Betterment is affordable and effective. It’s so easy to use, and so effective at growing wealth, that new investors are signing up by the thousands. We love how responsive Betterment is to user feedback, how quick they respond to our emails, and how many useful features and improvements they’ve added in a short time. We only expect Betterment to get better. Even now, they’re a true leader in the robo-advisor and modern investment landscape. Read our Betterment Review to learn more about the platform. Great review Joshua. I started with Betterment and I really enjoy it. I actually talked with a few of their employees that came from iShares and Vanguard because they like the platform so much. I know that their fees are a little higher, but I have really found some good success with them and recommend them to anyone looking to get into investing. Good to hear you have had success with them Grayson. I’d definitely give them a shot but I think they might be only available for Americans. The hands free approach would be pretty convenient for many people. Great review, I guess this is a good option for people who do not really want to learn or stress about investing options on their own for an added fee. Exactly. Not everyone has the time or desire to learn about investing and keep on top of it all. So there needs to be an option where people can let a company choose which specific investments they are purchasing. I was previously oblivious to their existence, so thanks for a thorough write-up. Yes this is probably a good idea for beginner investors. Or people can use this as their option for safe investing while being a bit more risky with a separate account. I have tried Betterment and found it is super easy to use and great for someone who either doesn’t know how to invest or who doesn’t want to deal with rebalancing or choosing funds. It does sound like a solid platform for anyone that is new to investing. Choosing funds can be quite difficult for a beginner to tackle on their own, especially knowing that you have to keep an eye on all of those selections. Thanks for writing this review! I’ve been intending to start investing with Betterment, but this gives it a very good review form someone who has used it before! Can’t wait to start an account there! Good luck Christine. It sounds like it’s pretty easy for new investors to do well on Betterment. Woo! I just started! One month in almost!! Yes, in the long term, it may be best to learn to handle investing on your own. That isn’t practical for everyone though. For some people free time is at a premium and they’d gladly pay fees to save some time. Definitely looks like a suitable way to invest for those who don’t want to dedicate the time to learning about direct investing. The slightly higher fees make sense if the alternative was to not invest at all due to not having the knowledge. The hurdle is more than just learning about direct investing. You also have to be very diligent about researching companies and monitoring those companies regularly. Thanks for the review Josh! I never heard of Betterment until this morning. Fees can add up so I guess you have to find out if it makes since for you to use. From the comments seems like people have had a good experience with them. I get free trades right now so I like where I am at for the moment. But you never know. Someone at your level probably wouldn’t have any incentive to switch over, especially since you get free trades. For more of an entry level investor, it’s a solid option though. I really recommend Betterment to folks who can’t put up the large starting balance for a lower fee account like Vanguard. When saving for a large balance requirement investment account, it can be tempting to use that money for something else (oh look, my friends are going on a cruise, I can postpone starting that Vanguard account…) so having that money already invested ensures it can’t be used for non-retirement fun. Good point Tara. It does take a lot more money to get into something like Vanguard. By starting somewhere like Betterment, you can get your feet wet and get some returns on your money in the meantime. Katherine from Betterment here. Thank you for your thorough review – it was great to see you write about us. I just wanted to clarify our fees – they range from 0.15% to 0.35%. We keep our costs low to help customers avoid erosion of their returns. Would appreciate if you could update the review. Thanks for dropping by to check out the review Katherine. I have updated those rates. I appreciate you pointing that out. With all of the positives involved with Betterment, there are costs. Don’t get me wrong, it is a great product. However, a great deal of my investing success (not just in equities) is in minimizing costs or eliminating them completely. This product is perfect for someone with limited time and knowledge of picking stocks and ETFs. Yes a serious investor should be very concerned with their investment costs. Early on though, most people just don’t have the time or expertise to properly manage their portfolio. So paying those costs could be very worthwhile in that scenario. Sounds like the perfect investment vehicle for someone like us, Joshua. Thanks for the thorough review! Let us know if you do end up giving it a shot Laurie. You could write all about your experiences on your blog. This is the first time I’ve heard about the Betterment account, I love reading your reviews and this is something I’m definitely going to check out. While were on the subject of reviews have you considered review UK products? I only say this because I’m from the UK and there are a lot of people here who enjoy your reviews. Anyway, great post. Does using Betterment’s software actually aid customers in becoming more educated investors so that they eventually can transition to a more self-directed tool? Put another way, does Betterment give you fish AND teach you to fish? This sounds like a great option for someone like myself, who doesn’t have any experience. Thanks for the in-depth review! Sounds like the perfect investment option for a newbie like me. Your reviews are always so helpful, Joshua. Thanks! Great Betterment review. I’ve not heard before about it but after reading your review I’ll surely check out. As betterment sounds to be great platform for those who want to enter into investing world without much hiccups or stress. Hope there is no hidden factor with it, else it will soon lose its ground. Since everyone wants to have safer mode of investment with great future return. I’ve decided to finally sign up and let the professional do the job. Even though there are cost with betterment. I still think it’s a LOT cheaper than leaving my money at E-trade and doing the trades myself. months now 80/20 stock/bonds. But I think these are terrible results. Is it just a bad year for EFTs? What’s your take on this? Thanks for this review. It seems like more and more apps/companies/brokerages are looking to entice 20 somethings to invest. While I like the idea of making investing simple and somewhat automated, I think it can be easy for anyone to start on their own and build their own dividend income portfolio with the likes of Loyal3 or Sharebuilder. Easy, no/low fees and buy 20 or so solid dividend payers, reinvest and just let time compound your dividend income. Have you seen Acorns? I wrote about them on my blog. They take your excess change from everyday purchases and buy ETF’s for you. I had requested a demo via their website 3 days ago and never got a response. I called to follow up and the excuse was that they have been overwhelmed with requests and cannot keep up. I can’t imagine what customer support would be like once I pay for the product. Typical growth company; too much marketing but not enough infrastructure to handle the workload. I suggest that anyone condsidering this company hold off until the dust settles. I’ve been using betterment for 2 years. I was testing their goals, which really aren’t goals but instead accounts, and I unintentionally deleted my goal or account and it transferred the money back to my account and lost the performance data. Their system does not stop simple mistakes and the result was pretty serious. I was pretty upset. Not sure I’m going to use them again. Their site isn’t ready to serious use if they allow a flaw like that. Great roundup as usual, really enjoyed your article about this Betterment Review. I will share this to my friends so that they can get tips before they invest in anything. Seems like a great platform for people that don’t necessarily have a huge amount of time or expertise to throw at investing. I personally still like to control the investment decisions of all of my trades though. Interesting review. Looks like Betterment is a good starting point for people who is entering the market. I’m not a proponent of diversification as a way to reduce risk. But Betterment is a good option for people who are just starting out. One advantage is the ability to invest in bonds. Investing in the right bonds can provide safe yearly returns with less risk that fluctuating big name stocks. Their tax loss harvesting feature is a good way to perform better on after-tax returns. If you have the knowledge to do your own research into equities and assets, it’s better to invest into stocks yourself, and write calls every month, in order to capture extra income. That’s my modest take. Josh, thanks for your review because I am planning to use the services of Betterment. 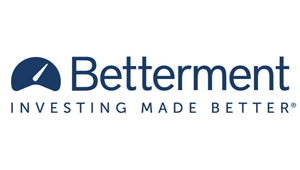 It seems like Betterment is a good starting point for investment and offers trustworthy investment strategies. Wow. What misunderstandings I’m reading about betterment. First, their fees are tiny compared to the low fees I pay elsewhere. Second, their customer support is awesome. You get s human fast, they are knowledgeable and results oriented. I am a seasoned investor; currently, my primary accounts are elsewhere but I opened a small account at betterment to try it. I like it. I’ve had them for a year now. I have had $100 a month auto deposited and am now sitting at NEGATIVE 4.2% time weighted earanigs and -$229 ROI. I highly recommend Acorns. Same idea but they actually will get you a return on your investment. If you saw no or negative returns in 2015 you were definitely not alone. The market was tough last year. I managed to scrape by with 3% over all growth but only because I have a very diverse portfolio with some great holdings in healthcare IT stocks. Basically last year was not kind. My year-to-date performance is about 3 times as high without making any major changes. My holdings are currently not in Betterment but I am looking at taking my taxable investments over to them. I rang up some taxable activity last year and would like to see if they can do better than I did with tax harvesting. I am seeing several comments saying this is great for new investors who don’t know much about investing. I looks to me like it could be good for any investor especially if you have a busy life and can’t spend time constantly researching your portfolio. I liked the comments by LM which were included in your review about creating buckets in the safety net goal. It sounds similar to a ladder strategy. I am considering starting an account using the cash sitting in my taxable brokerage account. Really nice review – I think this is a real gem for newer investors and the fees are very reasonable. It is amazing what your money can do when you don’t have brokers reaching into your pocket all the time to fund their high rise NYC apartments! Since Betterment was established in 2010, they haven’t experienced a major correction. What protections are in place to prevent large losses?